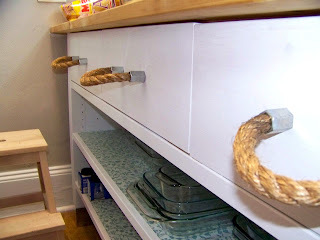 I really loved the idea of these handles and so the pantry pulled me back in (pun intended). Now I said I loved the idea of these pulls. 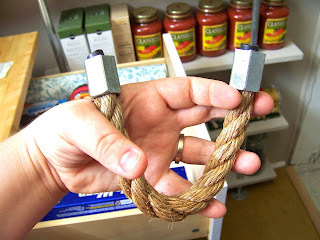 I didn't like the finish of these for our pantry and the gauge of the rope was a little small for me. 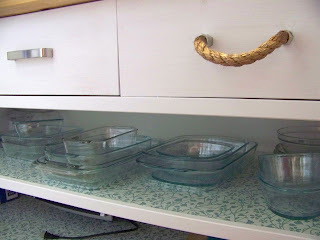 Also, with shipping, 3 of these pulls would have cost me $45 and that seemed a little high for drawer pulls that I didn't absolutely love (you can call me cheap; I fully embrace it). This is where Nate and my skills work really well together. I described what I wanted to Nate, who never saw the pictures. He then interpreted this idea and, with the help of a Lowe's guy who was willing to think outside the box, figured out how to make it happen. And this is how we did it. We started with 5/8 twisted manila rope and cut it into sections long enough for our 5" hole spacing on our drawers. We put a thin layer of electrical tape at the end so it wouldn't fray. Then we took a 5/8" zinc plated regular nut which was twice as long as we wanted and Nate used his sawzall to cut it exactly in half. 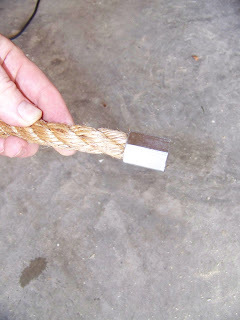 We then screwed the nut onto each end of the rope so that the non-cut end was toward the rope. Since both rope & nut were 5/8", this was a pretty snug fit, but we added some glue so that it would not pull out. 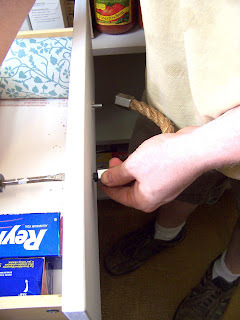 Then we used well nuts to secure the nuts to the drawer. These are really cool. 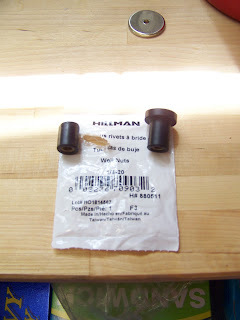 they are rubbery and as you screw a regular screw in, it bulges out and hold on to the nut. We cut the top off so that we wouldn't see the black against the drawer. Here is our handle ready to be attached to the drawer. We had to make sure that the nut was flush with the draw while we attache the screw so that the well nut would expand inside the nut. We really really love how these turned out. The rope really pulls in the burlap floor and the counter and the nuts incorporate the pipes in our shelving. Here is another finished pic. This project didn't take very long at all and we love the result! I really like those. Very clever way to make your own. 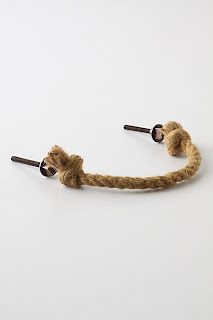 It's amazing what a piece of rope can be turned into. I love these, and the nuts do give it a nice and unique look. I have done some pulls with rope but wouldn't have though of the nuts. Good work. I found you at Twigg Studios Sunday Showoff. I hope you'll stop by and Visit at Quirky Vistas some time as well and see what's going on at my place! 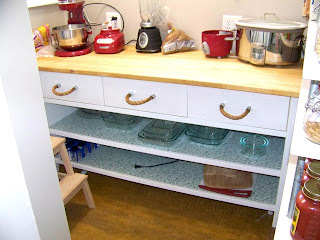 Hey, I am thinking of doing this in my kitchen but am wondering about durability. 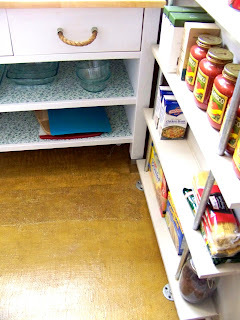 I mentioned this idea to my mother in law who has renovated a lot of houses in her life and she said in a matter of a few months they would get grungy from hand grease/dirt and food. Could you give some feedback on how they've stood up? Thanks! We haven't had any issues with durability. Granted we have these in the pantry which isn't used everyday but they have been used a lot and we do all of our baking in there and they still look just like new! Hope this helps. Just the job - well done. Hi there. I know this post is quite old, but do you remember if you guys had a tough time getting the rope inside the nut? 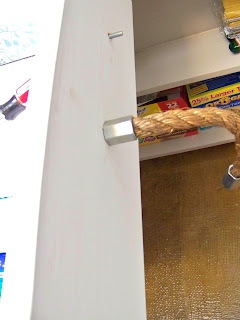 I'm trying to make these pulls, but I'm having no luck whatsoever getting the rope far enough inside the but to even come close to hiding the electrical tape. Yesterday my dad and I tackled this project to update a dresser of my grandmother's. After some trial and error we found an easier way for us to get the rope into the large connecter nut. 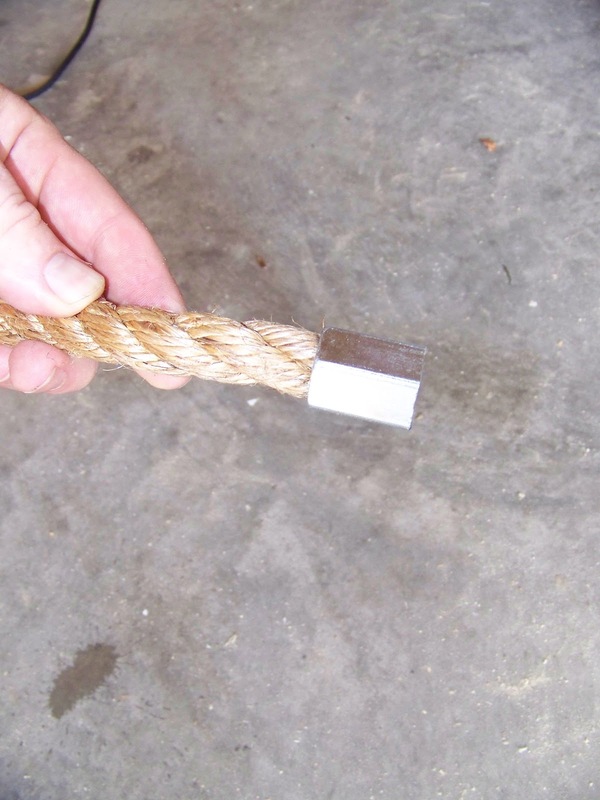 Once the rope is cut to your desired length, we applied a very small amount of super glue to the edges. Set aside to dry. Once dry we "whittled" or "shaved" it down a bit with a very sharp knife. The glue kept the edge in tact. It makes threading the nut SO much faster. 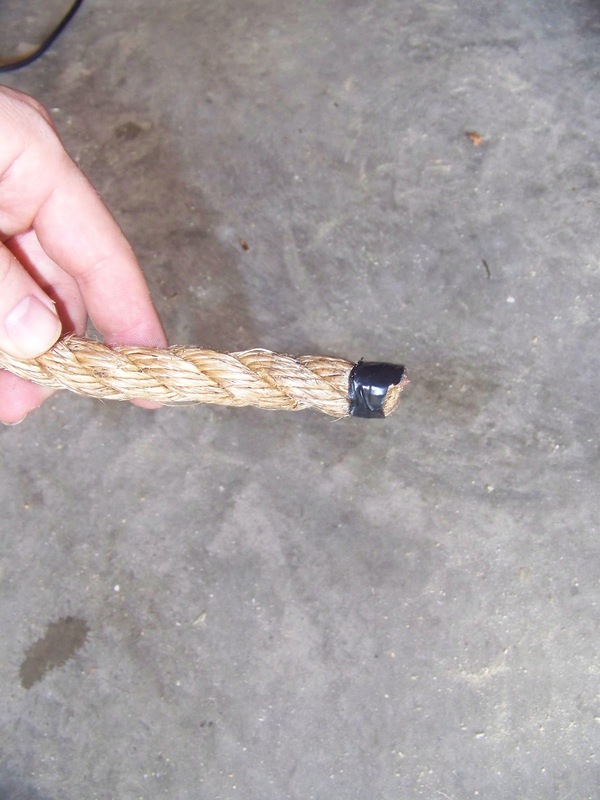 Once the rope is inside I applied a few drops of super glue into the nut as well. GOOD LUCK!